Last year’s puzzle from Colleague was based on the BBC One sitcom Ever Decreasing Circles and the Oozlum bird. I think the Inquisitor is normally the place for TV programme themes, but it was a fun puzzle nonetheless. This week we had a circular grid. 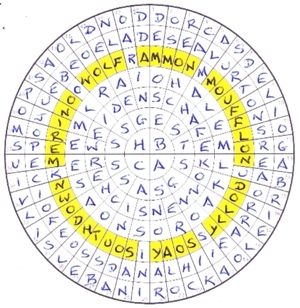 Now, I must have blogged a dozen or so circular puzzles here at LWO. Between you and me, they’re not my favourite, just as others dislike puzzles with jumbles or Playfair. Still, my shoulders are broad. As I expected, this was tough. As well as all the 6-letter entries, each quadrant had a 7-letter one which strayed into the central ring, but we were told that wasn’t a jumble. In hindsight, I should have got 1 Not all in sea bottom cleared by a sweep straightaway, but I didn’t. In fact very few came quickly and there seemed like a lot of cold (or, at least, luke warm) solving. Being told that no two adjacent answers had the same entry method certainly helped. With the grid about two-thirds full, I had SCHAF… in ring 5. It looked as though it could be German, and that idea was supported by “… in its original form…” in the preamble. A check with Google translate gave SHEEP, although it would probably end up being plural (SCHAFE). The first idea that came to mind was a wolf in sheep’s clothing, but Ein Wolf im Schafspelz didn’t really fit. Eventually, ring 5 spelt out SHAFE KÖNNEN SICHER WEIDEN which translates to Sheep May Safely Graze and I was surprised to discover that it was an aria by JS BACH, words courtesy of Salomon Franck. It didn’t take too long to work out that shepherds needed to go in the perimeter with sheep in ring 3, apart from the WOLF en déshabillé in the north-west quadrant. The sheep were fairly cut and dried, with AMMON, MOUFFLON, DOLLY, SOAY, SOUTHDOWN and MERINO. All that was left was to finalise the shepherds, except that took an awful lot of googling. As You Like It provided CORIN and SILVIUS and The Winter’s Tale MOPSA and DORCAS. OLD NOD came courtesy of Walter de la Mare, GABRIEL OAK from Thomas Hardy, and ABEL from the Bible. That just left one shepherd in the north-east quadrant to be tracked down. Eventually, after an awful lot of googling, I found him in The Seven Books of the Diana, “…a pastoral romance written in Spanish by the Portuguese author Jorge de Montemayor.” I must admit that seemed a bit like clutching at straws, but further research didn’t elucidate any other Delio, so I settled for that. Of course, I could have got something else wrong! Oh, and BACH is in the centre! In the end, this wasn’t as tricky as it seemed at first, although it was by no means a short solve. I’m still not sure about Delio, so I’ll just have to wait and see. Thanks, Colleague. This entry was posted on 24 August 2018 at 4:00 pm	and is filed under Solving Blogs. Tagged: Colleague, Cordon. You can follow any responses to this entry through the RSS 2.0 feed. You can leave a response, or trackback from your own site.